Mountain gorillas are critically endangered primates that inhabit two small pockets of forest in central Africa. Their global population is only around 700 individuals. Habitat loss and poaching are major threats to their future survival. 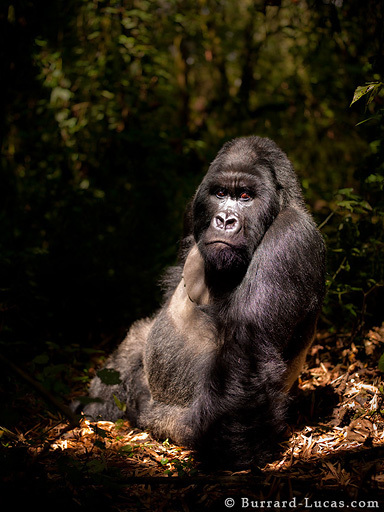 This photograph shows a dominant male silverback known as "Agashya" meaning "special one". He is the leader of a family known as Group 13, which currently consists of 25 gorillas. It was a magical moment when he sat in this isolated forest clearing, illuminated by a shaft of sunlight filtering through the canopy.